All effects are unlocked - no advertising - no hidden cost! Edge Pro is equipped with the new Sound System of Edjing, the result of five years of R & D, to provide DJs with the most reliable and responsive djing solution possible on Android. Designed by and for professional deejays, the look and feel, as well as the ergonomic of this new remix solution. To improve your mixing experience, access to more than 50 million tracks is for direct access to streaming sources like Deezer, Vimeo and SoundCloud! - Colored identification of sound effects in use. - Custom beats thanks to the "Tap BPM": adjust the beats manually as you like natural sweep and pinch gestures. In order to find and connect to your Mixfader, the app needs to activate your Bluetooth, and access your location. This is needed by the Android Bluetooth System. 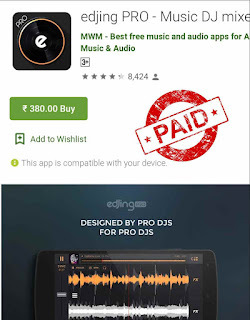 Mixfader requires Bluetooth LE and Android 4.3 fromwards.